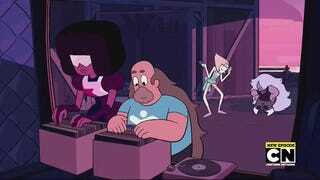 Steven Universe is never afraid to turn its deft characterization skills to characters other than Steven himself, leading to the entire cast being incredibly well-fleshed out. But the show is always at it best when it turns its hand to Connie, and through her, the growth of Steven as a character as well. Yes, even though “Steven’s Birthday” is about Steven celebrating his 14th birthday—and a nice acknowledgment of the long-running question of just how Steven ages as a half-human/half-gem hybrid—it’s really about how Steven perceives himself through the eyes of other people. Whether it’s the Gems, whom he has to prove himself as a fighter and one of their team, or to his father and Connie, whom he has to both protect and be a son and friend to. As someone who wants to do good, Steven thrives on seeing that he has a positive impact on other people as a sign of his own personal growth. That’s the whole conceit of this episode, when Steven tries to artificially “stretch” himself into a teenage form using his gem powers—not because it’s his birthday so he feels like he needs a growth spurt, but to show the people around him, especially Connie (who he overhears seemingly freaking out at his weird aging process), how much he’s grown. 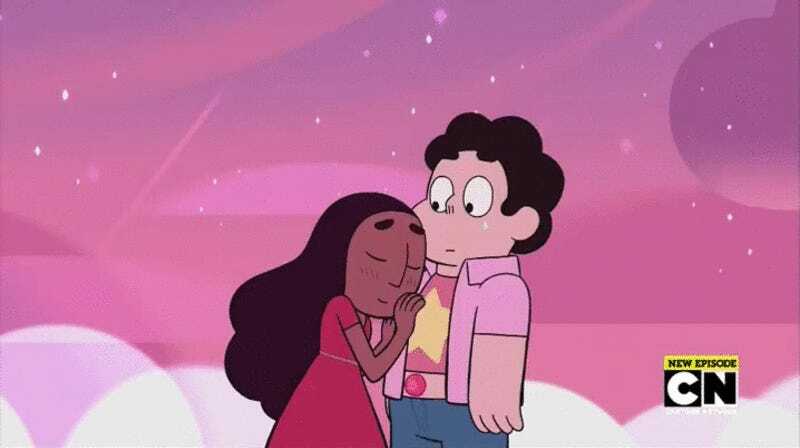 But what Steven doesn’t realize is that Connie is so understanding, and close to him, that she doesn’t care about his appearance, as long as she’s still his friend, even if he isn’t human like her. She doesn’t get weirded out when he’s taller than her after his growth, and when things go haywire and he accidentally reverts into a baby, she promises to look after him. Even her relief at his return to normal form (with the presence of a lone facial hair as proof of his actual physical aging) is tempered by the fact that she wants to stay by Steven’s side no matter how weird things get. All it took was a reminder of what a great friend Connie is to him for Steven to get himself back on track. D’aaw. Ugh, this show is so cute sometimes I think I have a toothache after watching it.